President Trump has always campaigned as being a staunch ally of American farmers. He promised them better trade deals, and he then proceeded to bail them out after his recent trade war began hitting their bottom lines. Even with taxpayer funded bailouts, farmers, particularly those in the Midwest, are struggling mightily. 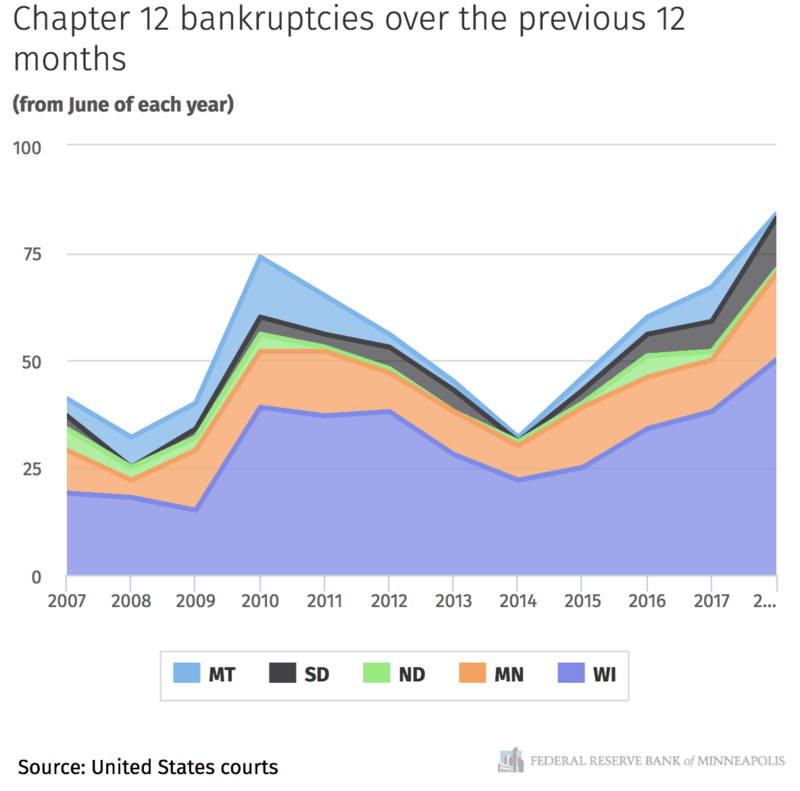 A recent report by the Federal Reserve Bank of Minneapolis, shows that Chapter 12 farm bankruptcies have soared in the Upper Midwest (Montana, South Dakota, North Dakota, Minnesota, and Wisconsin) since President Trump took office in January of 2017, easily surpassing those numbers under President Obama. In fact, in Obama’s worst year (2009-2010), which came right after the 2008-2009 recession that started under George W. Bush, farm bankruptcies in these states still did not reach the levels they were at between June of 2017 and June of 2018 under President Trump. 84 farm operators have filed for Chapter 12 bankruptcy in the Upper Midwest in the 12 months ending in June 2018, easily surpassing any single year under President Obama. While there are surely a lot of factors at play here, there is no doubt that Trump’s tariffs have played a significant role.